We have been a little quiet lately (which tends to happen when you have a group run by young volunteers in their spare time). However, this week was a big week in the youth employment space – on Friday 8 April 2016 the House of Lords Select Committee on Social Mobility published the report from their inquiry on the school to work transition for young people, particularly in relation to young people who do not attend university. 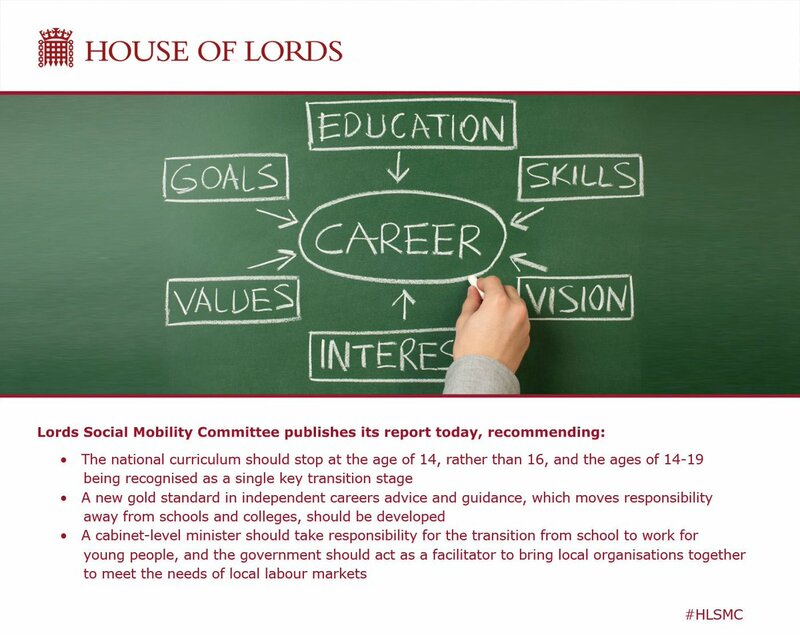 The Select Committee on Social Mobility was appointed by the House of Lords on 11 June 2015 to consider social mobility in the transition from school to work for 14–24 year olds and included a group of experts on the subject, ranging from former Labour Education Secretary Baroness Morris to Conservative peer Baroness Stedman-Scott, former CEO of the charity Tomorrow’s People (she is also a supporter of The Found Generation and a member of the All-Party Parliamentary Group on Youth Employment). We are also pleased that many of the policies we called for in our evidence and documents such as our Manifesto for Youth Employment have also been backed in some form by the Select Committee, including a requirement for high quality careers advice and guidance (supported by appropriate labour market information); ensuring that a specific government minister will assume ultimate responsibility for the transition from school to work for young people; and suggesting that the Government should act as a facilitator to broker collaboration between existing local organisations in a local area – such as FE colleges, schools, local authorities, LEPs and employers – to support young people in that area. It is very clear that the Government need to do a great deal more to tackle these problems and to ensure that they do not continue into the future. This report is a valuable one but it is in some ways the latest in an ongoing series of reports which show that politicians of all parties have not done enough to deal with the issue of youth unemployment or to improve the life chances of young people from all backgrounds. We set up The Found Generation to tackle youth unemployment and prevent a ‘lost generation’ – so it somewhat depressing to see that, despite recent very welcome falls in youth unemployment, the Select Committee on Social Mobility argue that a generation of young people have been and remain ‘forgotten’ or ‘overlooked’ by policy-makers and that the underlying causes of and reasons for youth unemployment remain largely unaddressed. We are concerned that the recent falls in youth unemployment have made the Government complacent. Even the March 2016 Budget, which was billed as a Budget for the “next generation“, appeared to put forward very little in the way of policy change or additional support for young people to tackle youth unemployment. We hope that the Social Mobility Committee’s report will provide a much-needed wake up call for the Government.